This is my first pot roast, however, pot roast as I found out, is basically braising meat over low heat over a long period of time. 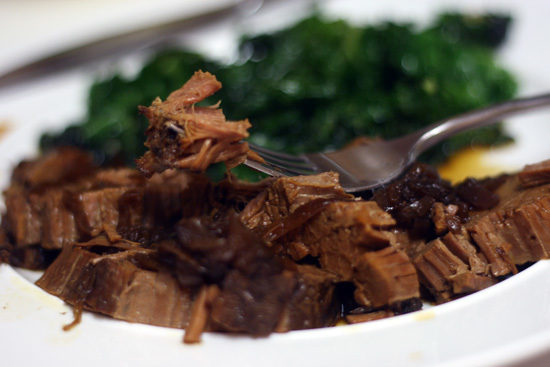 I've mostly braised brisket or short ribs, but this time I used a cut of meat that was foreign to me – eye round roast. I've always seen it at the grocery store but never cooked with it. It's a somewhat tougher piece of meat and that's why it must be cooked long and low. Long and low –yummm. The meat was tender and falling apart at some parts, especially the bottom. I love the fallen apart saucy mess at the bottom of the crock pot, I usually eat that first while slurping up the sauce. 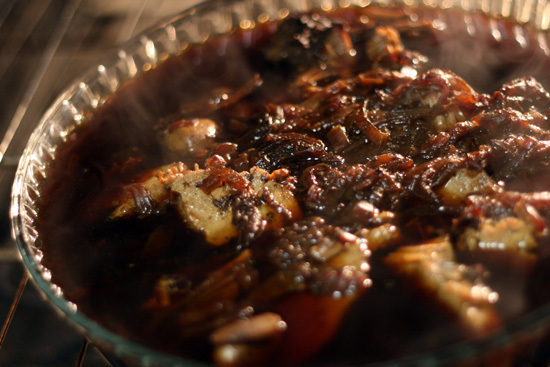 This recipe has very minimal ingredients: water, red wine, soy sauce, sliced onions and brown sugar. Oh and garlic, can't forget that. Mine came out a tiny bit salty because I salted the meat and added soy sauce, which already constitutes enough salt. So, don't salt your meat beforehand. All you do is dump the water, red wine, soy sauce, onions and brown sugar in the crock pot with the meat, set on low and 10 hours later you will have a saucy roast beef. It is best eaten the next day, but the day of is fine as well. 1 Slice onion into half moon slices and throw it in the bottom of the crock pot. Take one of the garlic cloves and slice very thin, put aside. Mince the other clove and throw in with the onions. 2 Pour in the wine, water, soy sauce and brown sugar over the onions and garlic. 3 Pierce a few slits around the meat and insert the garlic slices in each one. 4 Drop the meat in and cover. Set on low for 8- 10 hours. Your thought process is wonderful.The way you tell about things is awesome. i always wait for your posts. I just discovered your blog and wow, your photos are gorgeous! My mom put a pot roast on every Sunday before we'd go to Church. We'd return home to the wonderful smells of braised meat and vegetables. It's one of my favorite meals to this day. Beautiful photos! I have everything except the roast which I will be picking up tomorrow! Thanks!